In my posted review of Alfred Hitchcock’s movie Shadow of a Doubt I wrote that Edna May Wonacott (who played Ann Newton in the film), gives the best performance by a child actor in the entire Hitchcock canon. And there are quite a few memorable ones: Veronica Cartwright in The Birds, Desmond Tester in Sabotage, and Jerry Mathers in The Trouble with Harry spring to mind. What makes Edna’s performance stand out? Her character Ann Newton is wise beyond her years. Other members of the Newton family treat her like a child, (which she certainly is), but she makes very mature observations. Edna’s character gets many of the best lines in the movie, and many of them produce a smile. My favorite line involves her character Ann commenting on her mother speaking very loud into the telephone: “she thinks she has to cover the distance by sheer lung power”, quips Ann, a line rumored to be inspired by Alfred Hitchcock’s own mother. I also find it very significant that Ann is the only member of the Newton family who is on to her Uncle Charlie from the moment he steps off the train. She knows that something is not quite right with him. And Edna plays the part superbly. It’s a performance I always enjoy, in a movie I’ve seen many times. When I began to research Edna May Wonacott online, I soon learned that she is now Edna Green, and that she has quite a few fans. The Lady Eve (who writes a blog on classic movies right here on wordpress and other sites as well) wrote a fantastic piece about Edna, which piqued my interest even further. I was determind to write to Edna, and ask if she would consent to an interview for my blog. Edna not only did reply, but graciously agreed to answer all of my questions about “innumerable things”, to steal a line from her character in the movie. What follows is the complete text of our interview. Steve: How did you come to be cast in Shadow of a Doubt? Edna: I was standing on a street corner in Santa Rosa waiting for a bus to go home. We had relatives visiting and my cousins and I went to town shopping. Alfred Hitchcock and Jack Skirball the producer were standing on that corner looking at the intersection and discussing it, and I was kind of wondering what they were doing, and all of a sudden they started looking at me. My older cousin wasn’t too happy about it and made me move away, and they still continued looking at me, and finally walked over to us and introduced themselves, and said they were going to make a movie in town and wanted to know if I would like to be in it! Of course I said yes, and they said they would come out to our house and talk to my parents. Then the bus came and we went home. That afternoon they came out to the house and talked to my parents, and my mother and I went to Hollywood for a screen test, and that was how it got started. Did you become something of a celebrity in Santa Rosa? Edna: Naturally everybody in town was curious and lots of people came to my father’s grocery store that he owned, and wanted to touch the father of a movie star! There was lots of publicity about it and lots of people watching the making of the movie since most of it was filmed on location in Santa Rosa. The ensemble cast in this film is amazing. Everyone played their part so perfectly. Did you bond as a group, when the camera was not rolling? Edna: It was like a job for all of us, and we became good friends as coworkers do. We didn’t get together other than work. 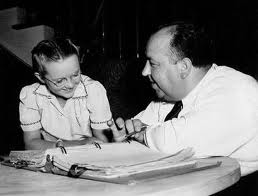 I did become a close friend with Alfred Hitchcock’s daughter (Patricia) and when we went to Hollywood to finish the picture I would sometimes go out to their house for weekends. That was fun. 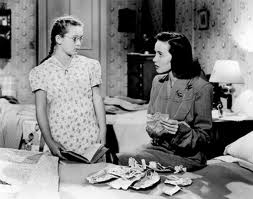 It seems to me Teresa Wright had the most difficult role in this film, and she gives an outstanding performance. What was it like to work with “big sister” Teresa? Edna: She was very nice, and so was everybody else who worked on the picture. We were like a big family and had a good time. Lots of practical jokes being played on each other and lots of laughs. Your character, Ann Newton, is the only one in the family who is immediately suspicious of Uncle Charlie. 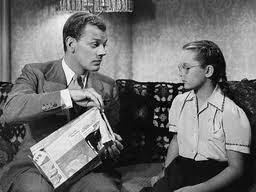 Did you receive any specific directions on how to play your scenes with Joseph Cotten? Did Hitchcock give alot of direction on the set to you and the other actors? Edna: I can’t say there were any specific instructions given. Hitchcock just explained to me how my character felt about “Uncle Charlie” and more or less let me do my own thing. He wanted not only my part but everybody’s part very natural and that was what I did. I did just what he asked of me and I guess it pleased him. He always described the scenes to us and it just seemed to come naturally. It was very easy to understand what he wanted and that was how it came out. If you don’t mind a little character analysis, why do you think Ann was on to Uncle Charlie so quickly? 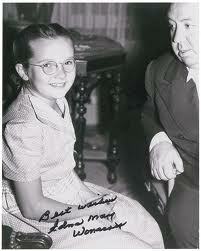 Edna: I was only nine at the time and didn’t really give any thought to why Ann felt the way she did. I can’t remember if I even knew the whole story until I saw the completed movie when it was made. When a movie is made it’s not filmed in the sequence of the story. We knew the night before what was being shot for the next day and that was the part you learned. Edna May Wonacott (far right) as Ann Newton, with the rest of the Newton family. In his autobiography, Joseph Cotten said the screenplay for “Shadow of a Doubt” was so good that hardly a word was changed on the set. Your character gets some of the best lines in the movie. Do you recall if the dialogue was changed much? Edna: I don’t have any idea if the original dialogue was changed or not. Probably not. I didn’t really give much thought to what my lines were and just did what they wanted me to. I know I had a good time everyday and enjoyed every minute of it. Mainly because of having such nice people to work with. Not only the actors but also all of the crew. 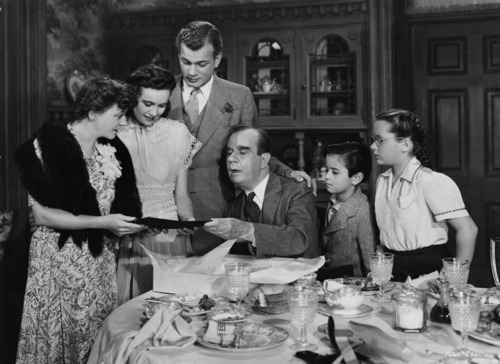 “Shadow of a Doubt” is one of Hitchcock’s most celebrated films of his early American period. It routinely makes “best film” lists, airs on television and at film festivals. Why do you think this film holds up so well, over 60 years after its release? Edna: It amazes me that the film is still so popular and everybody seems to remember it. It is really one of the true classics and I feel really proud to have been a part of it. I carry really fond memories for that part of my life, and I am thankful to have such a blessed time of my life on film, so to speak. I also have lots of scrap books and have been invited to lots of functions to show my scrap books and share that part of my life. In fact I still receive fan mail and a lot of it in the last few months has been coming from Europe. Lots of people in their 30’s and 40’s are turning to the classic films nowadays. I would like to extend my deepest thanks to Edna May Wonacott for taking the time to share her memories from the making of Shadow of a Doubt, one of Alfred Hitchcock’s best, and most personal, films. Great article and interview with Ms. Wonnacott! How lovely that she has such great memories of the movie and I only wish she had made more films! Thanks for reading the interview, I’m glad you enjoyed it! I couldn’t agree more, I sure wish she made more movies. Shadow of a doubt is my favorite movie. I have seen it literally a hundred times or more. I have studied it. Almost became obsessed with the house. Wanted to ask Edna if they filmed inside the house or on a set. I would love to speak with her. I am 70 years old and we live in Jackson Tennessee. Hi Helen. I also love “Shadow of a Doubt”. It is one of my favorite movies, and I’ve watched it many times. I can tell you that many scenes were actually filmed at the house in Santa Rosa, California. Eventually the cast and crew moved traveled to Universal Studios and finished the shooting on a sound stage, where many rooms of the house were recreated. The house is still standing to this day, it is located at 904 McDonald Avenue in Santa Rosa, California. I visited the house about 5 years ago, and it was a thrilling experience. I knocked on the door and nobody was home, so I took the liberty of taking few pictures. It looks exactly as it does in the movie. I was practically waiting for Teresa Wright to walk out the front door! Next Next post: Happy Birthday, Jimmy Stewart.